Photos by Lee Walls Jr.
Tuscaloosa’s historic Drish House has been a home, a church, a school and even an auto parts garage. Recently, it was the setting for an event that hadn’t been held there in many years: a wedding. The house, built in 1837, has new life and a new purpose thanks to Nika McCool of Mountain Brook. When she bought the empty building in May 2014, she wasn’t sure what she was going to do with it. She did know one thing: Her new property wasn’t going to be a frozen-in-time showcase. 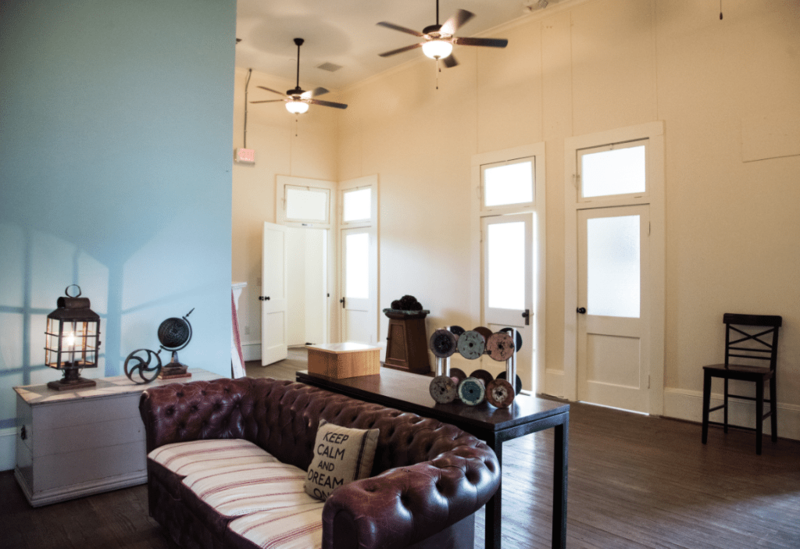 Turning the Drish House into an event venue was an “obvious answer,” she said recently. A front room on the main level provides plenty of space for large gatherings. Twin staircases lead to the second floor, where former Sunday school rooms have been turned into a bride’s room and groom’s room. 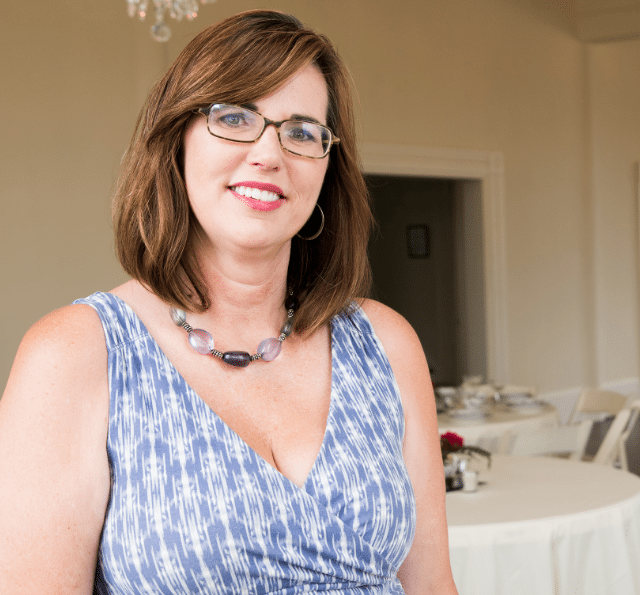 Nicka McCool, of Mountain Brook, has turned Tuscaloosa’s historic Drish House into an event venue. Vikki Grodner, the Drish House’s event manager, said the building has a flexible floor plan. Last month, the updated version of the Drish House hosted its first wedding. Lindsey McCutchen and Bear Danford got married there, using a 1920s speakeasy theme. 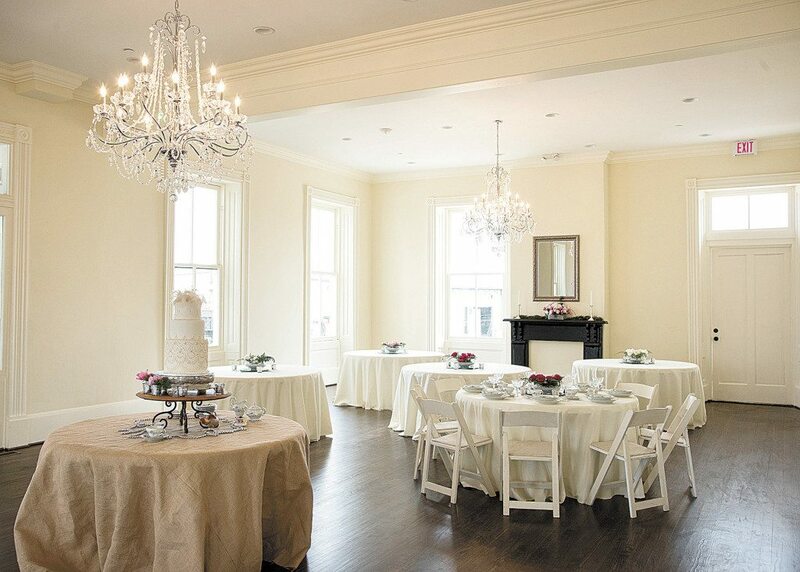 Interior renovations were completed just in time for the wedding. “We got our building permit on Feb. 11 of this year and finished in May,” McCool said. The house, built by Dr. John R. Drish, once was part of a 450-acre plantation. 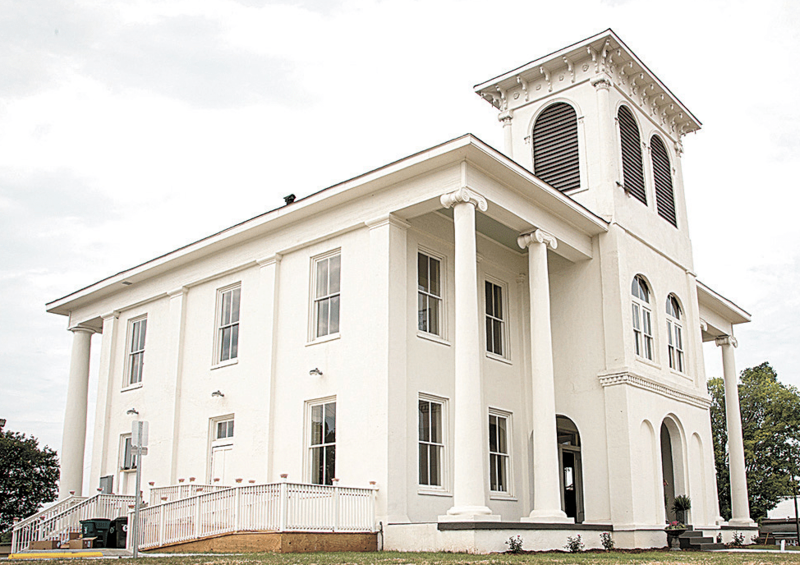 It’s considered one of the most distinctive examples of Greek Revival and Italianate architecture in Alabama, according to the Tuscaloosa Preservation Society. The Drish House was added to the Alabama Register of Landmarks and Heritage in 1975 and to the state’s “Places in Peril” list in 2006. McCool’s company, Past Horizons LLC, bought the house from the Tuscaloosa County Preservation Society. The Drish House was listed on the National Register of Historic Places in 2015. While the house was filled with happy guests at last month’s wedding, the original occupants haven’t quite left the building – at least according to legend. The house is featured in Kathryn Tucker Windham’s book “13 Alabama Ghosts and Jeffrey.” According to a chapter called “Death Lights in the Tower,” Dr. Drish and his wife, Sarah, have been seen wandering through the halls. The book says Sarah Drish wanted the same candles that were burned after her husband’s death to light her coffin while her body lay in repose. The candles were never found, which is said to be the cause of eerie appearances of fire in the third-floor tower room. After Sarah Drish’s death in 1884, the house had several different owners. It housed a school until 1925 and then became a parts warehouse for the Tuscaloosa Wrecking Co. Walker Evans captured the house during this period in a famous photograph that is part of the permanent collection in New York’s Metropolitan Museum of Art. Southside Baptist Church bought the house in 1940. The church added a sanctuary abutting the house on one side and a detached Sunday school building on the other. Both of those structures have been demolished – but one reminder of the church remains. Contractor Jeffery Harless of Harless and Co. is a Tuscaloosa native and grew up hearing about the house’s haunted history, he said. He worked with McCool when she bought and renovated the Caples House in the city’s Druid City Historic District several years ago. “The Drish House had become something of an eyesore, and I was excited about turning it into a great asset for Tuscaloosa,” Harless said. Bringing a house that’s about 180 years old up to current building codes wasn’t easy, he said. He and his crew worked six and seven days a week to get the Drish House ready for the May wedding, he said. “But overall, it was a pretty smooth, successful project,” Harless said. Grodner said she first became aware of the Drish House when she was working with the Nick’s Kids Foundation, the official charity of University of Alabama head football coach Nick Saban and his wife, Terry. Kate Edmonds and James McCool grew up as neighbors in Mountain Brook. 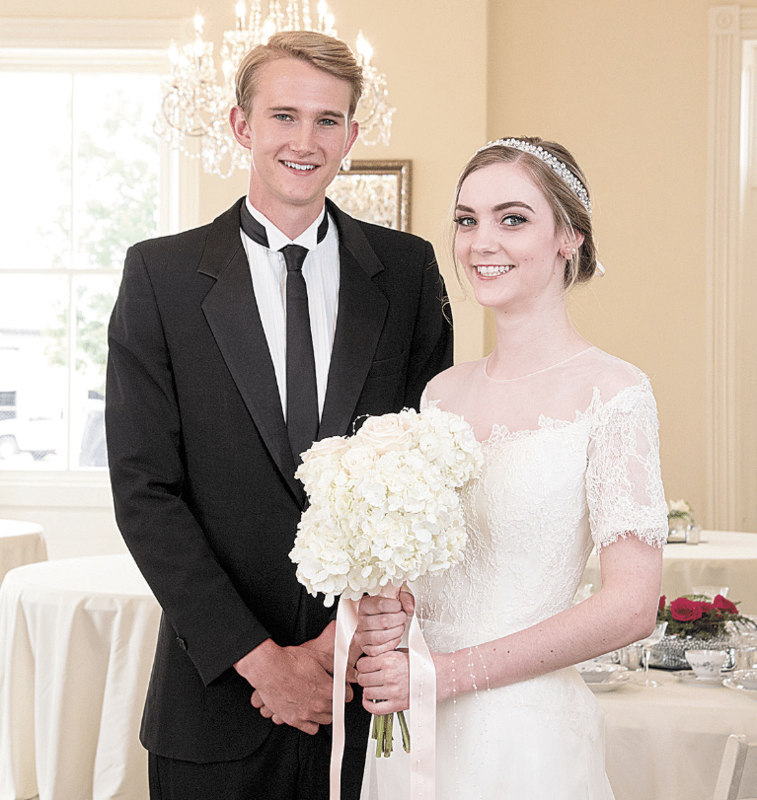 The “bride” is wearing a Heidi Elnora gown, and the “groom” has on his grandfather’s vintage Pierre Cardin tuxedo. The Drish House can seat about 200 at tables or 250 theater-style on the main floor. At the wedding in May, guests gathered in the front room for the ceremony and then were invited onto the front porch for cocktails while the room was set up for the reception, McCool said. A catering kitchen with its own access has a triple sink, work surfaces and an ice maker. Other features of the house include wireless internet and television as well as historic and contemporary house décor, including a refurbished piano drink cooler and a table made from an antique door. The spacious grounds have room for a tent if more space is needed. Weddings and wedding-related events such as rehearsal dinners and bridal showers aren’t the only events on the Drish House calendar. Alabama-born artist Nall will have an exhibition there in July, and birthday parties, civic organization gatherings and other special occasions already are on the books. The Drish House is at 2300 17th St. in Tuscaloosa. For more information, visit drishhouse.com or the house’s social media pages. To talk with Vikki Grodner about events, call 205-422-9713 or send an email to vikki@drishhouse.com.